Renowned REPXPERT, Alistair Mason, has been on the road in early 2019 visiting workshops to deliver training on LuK dry double clutch systems. The training gives technicians a better understanding of this expanding technology and opens up new business potential. In April, Alistair and other REPXPERTs will be providing similar training at the Autoinform LIVE training weekend in Cork. One of Alistair’s recent visits was to Mark Hudson, who runs Jon-Son Motors alongside his 19-year-old son, Joshua. They received a thorough overview of LuK dry double clutch technology covering operation, installation, diagnosis, tooling and replacement, using the LuK 2CT repair solution, before completing an IMI accreditation assessment. Garages in Ireland that want to expand their knowledge and skills base in a similar way have an ideal opportunity to do so at the Autoinform LIVE training event in April. As well as training on LuK dry double clutch technology, experts from many leading OE parts suppliers and other industry experts will deliver training on the latest automotive technology, repair solutions, diagnostic tips and new workshop business opportunities. The weekend provides the type of training that can prepare a garage or a technician for the challenges of the future, as well as providing genuine practical benefits that they can apply straight away. 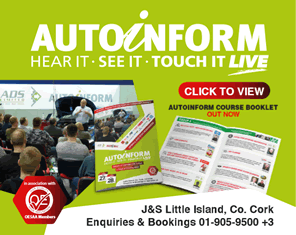 Autoinform LIVE takes place on Saturday April 27th and Sunday April 28th at the J&S Munster depot in Little Island, Cork. To book your place at this must attend training event please click here, or, for telephone bookings and more information please call 01-905-9500 and select option 3.